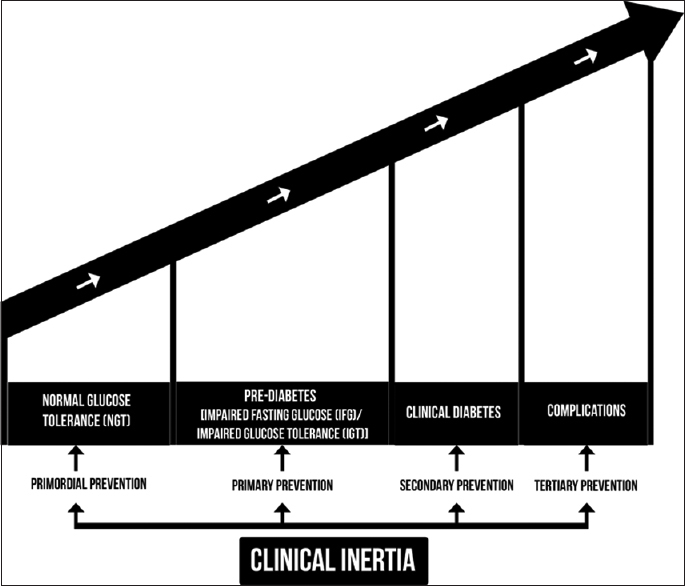 Context: Professional continuous glucose monitoring (P-CGM) has been approved for use in adults and adolescents with type 1 diabetes mellitus (T1DM). There is dearth of data on its use and feasibility in children <10 years of age. Aims: The aim is to study feasibility and acceptability of P-CGM with iPro™2 in children (<10 years) with T1DM. Settings and Design: Prospective observational study was conducted in out-patient setting of Paediatric Diabetes clinic at tertiary care Paediatrics centre. Subjects and Methods: The study was conducted among 42 children (2–10 years) with T1DM. Children underwent P-CGM (iPro™2 Professional CGM, Medtronic, USA) for 3–5 days after informed consent. 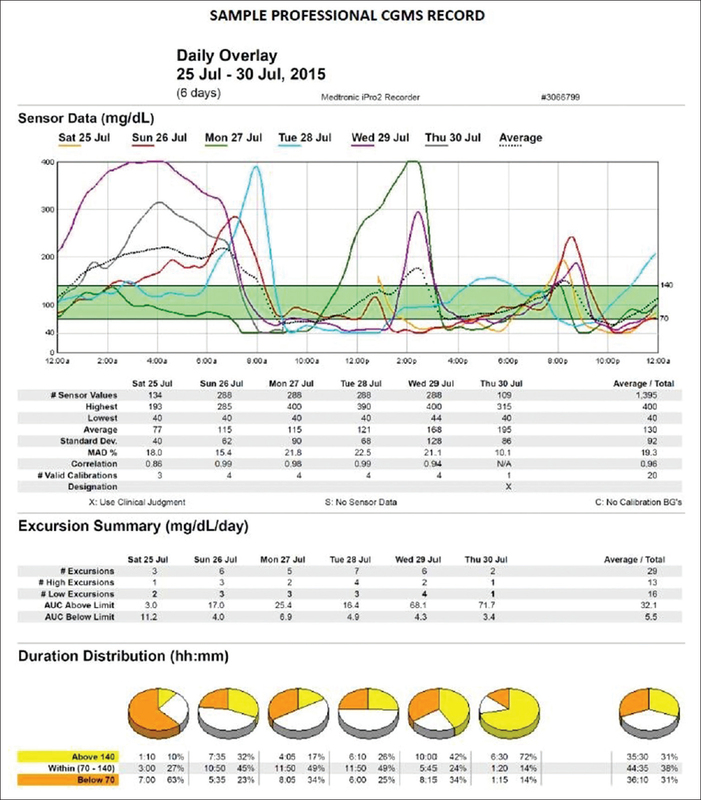 P-CGM data was analysed to guide diabetes management. Pre-defined criteria for feasibility and acceptability of P-CGM were assessed. 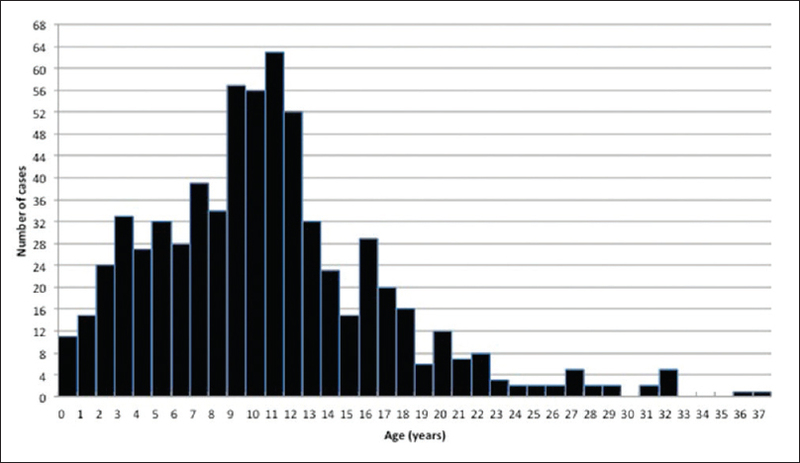 Statistical Analysis Used: Frequencies and proportions (expressed as percentages) of children with specific outcomes related to feasibility and acceptability were calculated. Results: A total of 47 sensors were used for 42 patients. Three patients underwent repeat P-CGM as recording was <48 h on the first attempt. Two sensors were damaged while insertion. Average duration of P-CGM recording was 84.6 h. Premature accidental sensor removal occurred in 2 (4.8%) among 7 (16.7%) children who reported fixing and stability problems. Three calibrated paired glucometer readings per day (for quality of P-CGM data) were seen in 40 (95.2%). Mean absolute difference of <28% was seen in 35 (83.3%) and correlation coefficient of >70% was seen in 31 (73.8%) children. Common adverse events were local redness in 11 (26.2%), local irritation in 16 (38.1%) and parental anxiety in 12 (28.5%) children. Conclusions: There were no significant adverse effects noticed with Professional CGM (using iPro™2) and is feasible and acceptable to children (2–10 years) with T1DM as well as their caregivers. Background: Peripheral neuropathy (PN) is a risk factor for foot disease in type 2 diabetes mellitus (T2DM). There are scanty data on prevalence of PN and its clinical correlates in Nigerian T2DM subjects without neuropathic symptoms. Objectives: To evaluate the prevalence and clinical correlates of PN diagnosed using objective methods in T2DM subjects without symptoms of PN. Materials and Methods: This is a cross-sectional study involving T2DM subjects at the Diabetes Clinic of Nnamdi Azikiwe University Teaching Hospital (NAUTH), Nnewi, Nigeria. History was obtained and physical examination done on subjects. Fasting plasma glucose (FPG) done on the day of assessment and values of glycated haemoglobin (HbA1c), and fasting lipid profile done within the preceding three months- were obtained from subjects' clinic folders. Diabetic Neuropathy Symptom Score (DNSS) was used to identify subjects without neuropathic symptoms. PN was diagnosed using tuning fork, and two biothesiometers. Data collection was done using researcher-administered study proforma. Data were analyzed using SPSS version 20. Results: 524 subjects [244 (46.6%) males and 280 (53.4%) females] were recruited for the study. 223 (42.6%) of these subjects did not have neuropathic symptoms and PN tested further with 3 objective methods. PN prevalence with tuning fork, analog and digital biothesiometers were 71.5%, 14.8% and 14.8% respectively. All clinical variables evaluated were poor predictors of PN (P > 0.05). Conclusion: PN diagnosed by objective methods is present in South-Eastern Nigerian T2DM subjects who do not have symptoms of PN. Tuning fork diagnosed PN much more than the other methods reflecting its subjectivity. Background and Objective: Incidence of gestational diabetes mellitus (GDM) varies globally from 2% to 14%. These cases in India are also increasing and emerging as a major public health problem. The prevalence of GDM among urban population of India has been reported as 16% and 17.8%, respectively. We conducted this study at three different regions of North India to estimate the prevalence of GDM. Materials and Methods: This pilot prospective cross-sectional study was conducted at three centres of North India with a base at Max Super Speciality Hospital, Saket, New Delhi, over a period of 10 months (December 2015–October 2016). Pregnant females attending gynaecology clinic at these centres were screened and enrolled as per the study inclusion criteria, after taking informed consent. Medical records were reviewed for recent haemoglobin levels, fasting blood sugar levels and other clinical parameters. Results: A total of 230 participants were enrolled in this study with 65 from Muzaffarpur, 65 from Bhilai and remaining 100 from Delhi, which include a mixed population. The overall prevalence of GDM was observed as 10%, with a regional prevalence of 10.77% at Bhilai, lower prevalence at Muzaffarpur (3.07%) and 14% in Delhi with a mixed population. A significant difference (P < 0.01) was observed in the mean age and body mass index of participants at Bhilai, Muzaffarpur and Delhi. 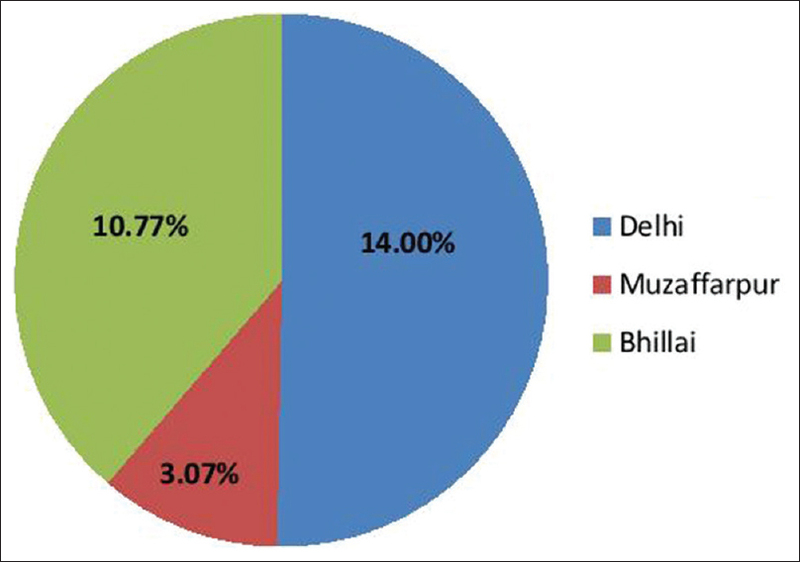 Conclusion: Although there was a variable sample size at these three centres, we could conclude from this pilot study that there is a high prevalence of GDM at Bhilai district while very low prevalence at Muzaffarpur and Bihar. Large-scale studies are required to be done to estimate the prevalence in these regions, which would ultimately create awareness among clinicians to screen all females for GDM. Background: Vitamin D deficiency is known to be involved in the development of insulin resistance and type 2 diabetes (T2D), and the functions of Vitamin D are mediated through Vitamin D receptor (VDR). 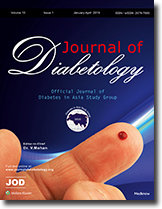 Only a few reports are available in the Asian Indian population highlighting the role of VDR polymorphism in diabetes. We aimed to investigate the association of VDR gene polymorphisms (TaqI, BsmI and FokI) with prediabetes (PD) and T2D and their relationship with anthropometric and biochemical parameters in Asian Indians. Subjects and Methods: In this study, 454 participants including 147 with normal glucose tolerance (NGT), 145 with PD, and 162 with T2D were enrolled in this study. 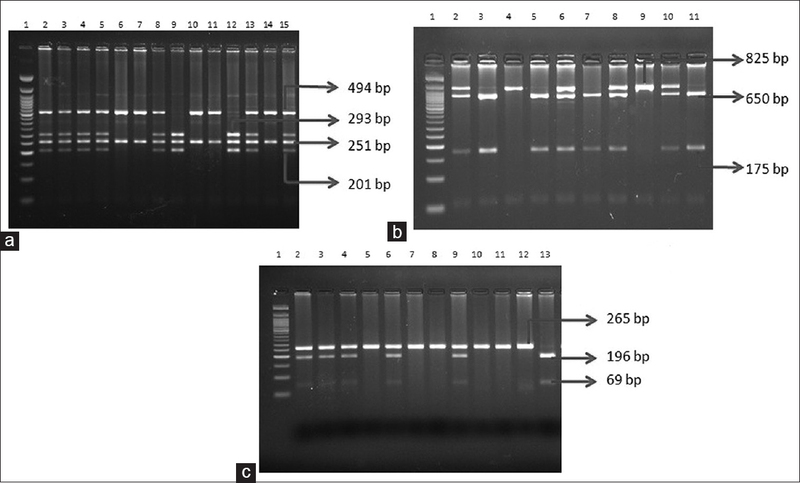 Genetic variants of the VDR were genotyped using polymerase chain reaction-restriction fragment length polymorphism method. Anthropometric measurements were done in all participants. Results: The most common genotypes for TaqI, BsmI, and FokI were TC, GA, and CC, respectively. The allele distribution of TaqI differed significantly when compared between NGT and T2D group. A significant protection was shown against T2 in VDR TaqI genotypes after adjusting for age, gender, and Body Mass Index. The levels of homeostatic model assessment for insulin resistance, fasting insulin, and the waist-hip ratio were significantly higher in TT genotype when compared with TC + CC genotype of TaqI polymorphism in NGT. In PD group, the levels of serum cholesterol and low-density lipoprotein cholesterol were significantly higher in AA genotype when compared with GA + GG genotype in BsmI polymorphism. Conclusions: The study indicates VDR TaqI, and BsmI polymorphisms seem to influence anthropometric and biochemical parameters, and in particular, VDR TaqI polymorphism offers protection against T2D in Asian Indians. Background: There is a paucity of literature on epidemiology of type 1 diabetes (T1D) in Sri Lanka. This study reviews the characteristics of patients registered in an insulin bank programme in Sri Lanka. Materials and Methods: Data were collected and analysed from records of all 672 patients diagnosed with T1D registered in the insulin bank with dates of the diagnosis ranging from 1971 to 2016. Results: Of the 672 patients, age at the diagnosis ranged from the day of birth to 44 years. The majority of patients, 526 (78.3%) were diagnosed before 15 years of age, with 7 (1.0%) cases diagnosed before 6 months. Females accounted for 56.8% of cases. The ethnic distribution of T1D in the study population was consistent with the overall population. Conclusion: This study gives some insight into the epidemiological features of T1D in young people in Sri Lanka. The peak age at the diagnosis is similar to studies in the western countries. This study also demonstrated a slight female predominance and a small but significant number of cases diagnosed in infancy. Further epidemiological and clinical research would help guide organisation of care and distribution of resources in the management of T1D in Sri Lanka.